The 1,100 square foot Holiday suite is a four room suite which includes a hidden room to explore and a whirlpool for two in the private bath. The 3rd floor location offers a view of the Cedar Rapids and Marion area from the sky lights. 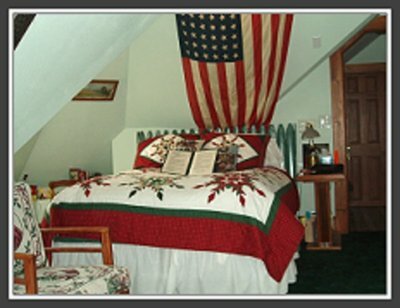 There are 3 Christmas trees decorating this treetop hideaway, and a 48 star flag above the bed. Both bed and breakfast rooms have in-room refrigerators that are stocked with a bottle of sparkling wine or sparkling grape, adult beverages, meat and cheese tray, an evening dessert and chocolates.